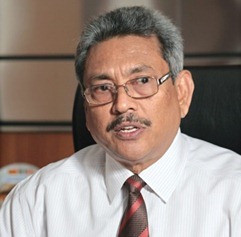 In a revealing interview published in today’s Daily Mirror, Sri Lankas Secretary of Defence and Urban Development Gotabaya Rajapaksa was caught contradicting himself on two occasions, pertaining to the alleged assault of a Buddhist monk on the day of Poson Poya, and his power extending to the Police force. The interviewer then asks Rajapaksa if the assault was true, to be met by a stoic answer by Rajapaksa who says the monk was intact assaulted. Soon after, in the next question Rajapaksa is asked about the report of the Judicial Medical Officer regarding the assault of the monk, and Rajapaksa runs into a rant, backtracking from his previous “assault” stance. He instead says that “there was an incident, it can be pushing” etc. The main justification of the BBS rally and the subsequent anti- Muslim riot was the alleged assault of the monk. However, highly placed sources in the Police and Law Enforrcement agencies told the Colombo Telegraph that there was no assault on the monk. The monk Ayagama Samitha had lied regarding his injuries and got himself admitted to the hospital. The Answer of Rajapaksa also indicates that no such assault took place. A judicial Medical Officers report is mandatory in each assault case pending Police inquiry. Further he asks the interviewer why Rajapaksa is blamed for the failiure of the Police. “But still why blame me? The Police doesn’t come under me, it’s a different Ministry in itself. Why am I blamed?” he first said. Thereafter he details how he “instructed the IGP” and defends the actions of the Police during the riot. Following are parts detailing his power extending to the Police. No, I think that’s wrong. The Police has taken action at all times. The problem is that some people expect the Police to take action in different ways to different people. “I was in Mihintale and the IGP and the Secretary to the Ministry of Law and Order was also there. As soon as we got to know about this I knew it could escalate into something unwarranted because the area is a very sensitive one. Even in 2007 there was a similar tension in this area. I immediately instructed the IGP to go toAluthgama. I also requested the secretary of the Ministry of Law and Order to go there. The IGP on the same night immediately came to Aluthgama. Look at the action taken. That is why I cant see the reason as to why the people are blaming the Police. A senior DIG of the Western Province went there immediately, the STF was also brought in. That was the action taken by the Police, that was how they were able to contain the situation on that day. Yes, I definitely am because I am the first person and one who has worked very hard to bring stability to this country together with the President. I was in the forefront of defeating Terrorism from which we suffered for 30 long years. Due to the correct approach and understanding having understood the weaknesses we suffered in the past, we were able to defeat it and usher an era of peace and stability. Following this, a window of opportunity opened up to bring benefits to the people of this country. That is the main thing. This government has done a lot of work to this end – development of infrastructure and ushering in a very conducive environment for development etc. I think we were on the correct path. We saw massive investments flowing into the country, and the increase of tourism among many other areas in which we have seen rapid progress. This is what the government can do – creating an environment for entrepreneurs and the private sector to take this opportunity to participate and help economic development. In the meantime we also saw rapid progress in all war affected areas in the North which included de-mining, re-settlement, infrastructure development, rehabilitation among others. Among all else we have brought in freedom and democracy to these areas that had not tasted such for a long time. We have done everything to bring stability throughout the country and to maintain the peace that we brought in after so much sacrifice. Once all this was stopped what we wanted was to get the maximum out of the stability that we have ushered in and from that point of view, I am very sad to have witnessed these incidents. They gave a very bad image to our country and it affected many people who had an image of Sri Lanka being a peaceful and stable country. We saw the international media projecting Sri Lanka in bad light and that is very sad. Even the timings of the incident have affected all of us because we have a great challenge from within certain sections of the international community after the end of the war, a team to inquire has now been appointed by the Human Rights Council and we were working very hard with like minded countries to work with us and also to win their support. Therefore this is a very sad situation. This is why all citizens of Sri Lanka, irrespective of party politics, race and religion must come together and not forget the past. We must not forget the image that Sri Lanka projected before May 2009 and all you would have seen was violence, this is what we saw. We must not forget this past which was not very long ago. We must ask ourselves; do you want to go back to that era? Do you want the country to be projected to the world on the same angles as before?. We live in a global world and we have to depend on others, if you take tourism- no one would come to this country if the country was not perceived to be peaceful, would investors come to this country if there is no stability or peace? No. so we don’t want this kind of incidents ever taking place. After the conflict ended I am sure many of the people of this country which included professionals, politicians and others were relaxing. That’s what they have to do. But I worked overtime, together with the Defense establishment we never relaxed. Soon after the end of the war we worked hard to ensure that peace sustains. That is why this country saw peace and stability all this while. There were so many attempts by the LTTE to regroup and destroy the peace in this country. We were able to prevent that. I also want to point out the irresponsible statements of certain politicians regarding intelligence personnel. It was through the intelligence operatives that we were able to keep the peace, it was they who brought in KP who was leading and organising the international network of the LTTE. It was all due to the work of the intelligence agencies. It was they who provided all the intelligence for successful operations sacrificing a lot for this country. Unfortunately because of irresponsible acts of some people some of the intelligence personnel had to sacrifice their lives and I’m sure the country could remember that. These people are the ones who want to govern this country in the future, and if this is a calibre and mentality of the people who are attempting to govern, I don’t know what will happen to the security of this country. They have to be ashamed of themselves. If you go through a recent speech I made at the Kothelawala Defense Academy, you will see that I spoke of various potential threats to the country, and one of it was Islamic terrorism. I spoke of the possibility. Even at that time many Muslim politicians irresponsibly tried to blame me without understanding what I was talking about or the realities. They took action. They were living with the people. But in a situation like this where you have to fight a mob it is not easy to control. This is what I’m saying. Look at all the situations, in Sri Lanka or elsewhere. Look at the Katunayake incident, Rathupuswela and Chilaw. It is unreasonable to blame it on only one side. I want to take you back to the incident of the ‘Grease Yaka’ when a Muslim person killed a Police constable whose wife was pregnant. Was there a backlash against the Muslim community? No. the Police worked hard to prevent it escalating into any sort of violence. Why talk of only this incident? It is very wrong to blame the Police. When that murder took place the Police did everything it could to prevent the situation from escalating. But when there is a situation of a mob running riot it is difficult and different. The same thing happened in Katunayake, Rathupaswela and Chilaw. There was nothing racial about it. In Dompe when a criminal died in Police custody and the entire Police station was burnt down. These were not ethnic or religious incidents were they? When it comes to certain situations it is not easy. This is where people who are instigating should be careful. They should not bring it to a situation like that. It happens all over the world. Its difficult for the Police to control. Also once an incident of this sort happens, various other elements get in- like looters. This blame game does not work. What is important is to stop creating situations of this type. This is why I said that we have to be very careful. I also must say that it is the President who has solutions to all these problems. He quelled terrorism and it is he who could solve problems of this sort. What I’m saying is if there are issues that affect the people, if the Sinhalese the President is the only person who could solve them. Everybody should present these problems and the President will solve it. Nobody else can solve them. You can shout and cry, you can fight on social media, but the problems will not be solved. The problems can only be solved by him. I have nothing to do with the BBS. I am not at all involved in any of this. All this stems from baseless accusations, and I will always say that some Muslim politicians and Opposition politicians have wrongfully put the blame on me. The media also has done the same thing. What facts do they have to say that? Its very unfortunate that some people write these baseless factless articles, that is very wrong. Due to these writings the international media also believe them to be true. This is very wrong. The people who write these articles are insane. Why would the President want to damage the stability, why would he want to lose his vote base? Why would a leader want to create trouble in a country? its insane to think like that. I am the person who worked day and night, working hard to bring and keep stability in this country while they were sleeping and writing. They want to become heroes by writing this sort of nonsense. They write without any facts.I am not worried about them because they can’t do any good to this country. They are the people who have accused this country of not having media freedom, this is evidence of that freedom. But they misuse that freedom. I will give up this post if they can prove this. I will leave this post if they can prove that I have any connection with any of these organisations. I am not afraid to say that I am a Buddhist. I am not afraid to say that there are issues that are harmful to the sentiments of the people. But I don’t condone violence. I don’t say that violence is the solution to this. I am not afraid to say that there are issues for the Sinhalese. Not only for the Sinhalese but even the Tamils have issues. If you specifically speak about the Muslim community not only the Sinhalese Buddhists, but the Sinhalese Catholics also have certain issues with them. In Mannar there are no Sinhalese but there are issues between the Muslims and the Tamil Catholics. What about the Tamils in Batticaloa? They have issues. What about the Catholics in Wattala and Ja-ela who have brought these issues to me. This is why I believe that we have to talk to the Muslims. I am currently conducting a wide ranging dialogue with them. Moderate Muslims have told me that they have issues with certain extreme elements of the Muslim community. They have told me about them. We are working with these moderates. I am not saying that there are Muslim terrorists in this country. The Indian intelligence agencies have told me that there is a possibility of Islamic Terrorism being based in Sri Lanka to act against India. However, we investigated these concerns and found that there is no merit in these concerns or claims. Our intelligence agencies are very active on these issues. But there are certain instances which go beyond the Security forces and the Government. The religious leaders must work together on them, they have to ensure that other communities sentiments are not harmed. I have worked on this throughout. I have met the Muslim community and religious leaders many times, our intelligence agencies have worked with them to prevent this sort of issue. This is not how the media should work, this aggravates the situation. It doesn’t help the country. I don’t see how such foolish, baseless articles could bring harmony to this country and society. This is not the way to do it. They should understand this and analyze this better. They should call for the elders and the leaders to come forward and find solutions. ( Laughs), If the President invites me I will definitely come and I assure you that I can do much better than many of these politicians currently holding office.